The Washington Post on Thursday released the full transcripts of President Donald Trump's contentious phone conversations with Mexican President Enrique Peña Nieto and Australian Prime Minister Malcolm Turnbull on Jan. 27 and Jan. 28, respectively. The White House had prepared the transcripts but did not release them. 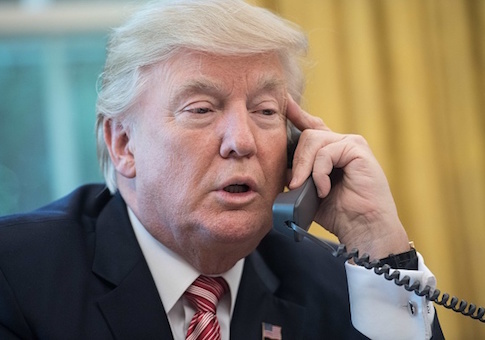 The phone calls reveal Trump discussing key and economic and security issues with both heads of state and, at times, disagreeing over heated issues like funding a wall on the southern border, trade agreements, and taking in refugees. In his call with Peña Nieto, which lasted 53 minutes, Trump said that the two leaders should stop publicly feuding over funding for a wall on the U.S.-Mexico border and work it out internally. "But my position has been and will continue to be very firm saying that Mexico cannot pay for that wall," Peña Nieto said at one point. "But you cannot say that to the press. The press is going to go with that and I cannot live with that," Trump responded. "You cannot say that to the press because I cannot negotiate under those circumstances." "I understand you well, Mr. President," Peña Nieto said. "I understand this critical point and I understand the critical political position that this constitutes for your country and for you, Mr. President. Let us look for a creative way to jump over this obstacle." Trump threatened to impose tariffs on Mexico during the call, but was less certain on the amount. "But you know, it could be 10 percent or 15 percent or it could be 35 percent for some products that, for example, are jobs ripped from their foundation and moved to Mexico," Trump said. "Most would be in the 10 to 15 percent range. That would make us very even with Mexico and it would make a lot of sense." Trump also scolded Peña Nieto for not adequately dealing with the drug trade. "They are sending drugs to Chicago, Los Angeles, and to New York. Up in New Hampshire – I won New Hampshire because New Hampshire is a drug-infested den – is coming from the southern border," Trump said. Trump's call with Turnbull, which only lasted 24 minutes, was more hostile. The bulk of the call involved Trump and Turnbull discussing an agreement that former President Barack Obama made near the end of his time in office. Under the terms of the agreement, the United States would vet and take in around 1,250 refugees currently held in offshore detention centers on the Pacific Island nation of Nauru and Papua New Guinea's Manus Island. Australia would, in turn, resettle refugees from Guatemala, Honduras, and El Salvador. "Give them to the United States. We are like a dumping ground for the rest of the world. I have been here for a period of time, I just want this to stop. I look so foolish doing this," Trump said. "Okay, good. Can Australia give me a guarantee that if we have any problems – you know that is what they said about the Boston bombers. They said they were wonderful young men," Trump added. Turnbull assured Trump that they were economic refugees. "Look, I do not know how you got them [the Obama administration] to sign a deal like this, but that is how they lost the election. They said I had no way to 270 and I got 306," Trump said. "That is why they lost the election, because of stupid deals like this. You have brokered many a stupid deal in business and I respect you, but I guarantee that you broke many a stupid deal. This is a stupid deal. This deal will make me look terrible." "Mr. President, I think this will make you look like a man who stands by the commitments of the United States," Turnbull responded. "It shows that you are a committed —"
"Okay, this shows me to be a dope," Trump interjected. "I am not like this but, if I have to do it, I will do it but I do not like this at all. I will be honest with you. Not even a little bit. I think it is ridiculous and Obama should have never signed it. The only reason I will take them is because I have to honor a deal signed by my predecessor and it was a rotten deal." After more back and forth about the refugee deal, Trump said, "I have had it. I have been making these calls all day and this is the most unpleasant call all day. [Russian President Vladimir] Putin was a pleasant call. This is ridiculous." Turnbull then suggested changing subjects to Syria and North Korea before Trump abruptly ended the phone call. This entry was posted in National Security and tagged Mexico, President Trump, Syria, The Washington Post. Bookmark the permalink.